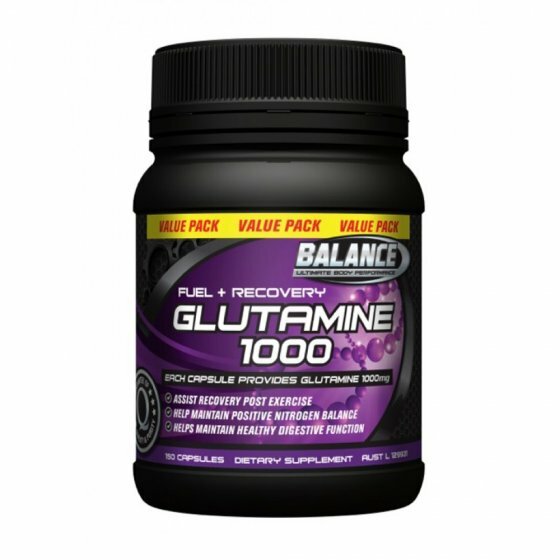 Balance Glutamine 1000mg supports muscle growth and assists your goal for lean body mass. Glutamine is the most abundant amino acid within muscle tissue, however, it's easily depleted during strenuous physical activity. Glutamine supports your recovery post-exercise, helps to build lean muscle tissue, helps to maintain positive nitrogen balance, as well as supports your gut health and immune system. Ideal for reducing muscle dehydration and muscle catabolism. Preserves muscle glutamine levels to aid recovery. Glutamine is utilised as a source of energy and for nucleotide synthesis by all rapidly dividing cells, including those that line the intestines and some immune cells (thymocytes, lymphocytes and macrophages). In the absence of sufficient Glutamine, the intestines atrophy and the immune function is impaired. Needed for energy production and DNA and RNA synthesis Glutamine serves both as a nitrogen and carbon donor and is thus an important muscle-building amino acid; helping to replenish muscle glycogen after exercise. Glutamine also has a significant role in protecting both the body and in particular the brain from ammonia toxicity through the synthesis of glutamine from glutamate. Ammonia produces Nitrogen-based free radicals and reduces ATP production through its interference with the oxidative metabolism of neurons. Glutamine users often report more energy, less fatigue and better mood and part of this relates to its role in maintaining proper blood glucose levels and pH. The body’s need for Glutamine increases beyond the normal 3.5 to 7g derived from the diet, during periods of physical or emotional stress. Glutamine is also significant in maintaining a healthy gut and improves the absorption of other nutrients. It is a very important nutrient for intestinal health. When extra energy is required, Glutamine together with the amino acids Alanine, Glycine, Serine and Threonine is readily catabolised in the liver to glucose. Directions: Take 1-5 capsules daily, immediately following exercise or training sessions. Up to 3 x 5 capsule serves may be used per day. NOTE: DO NOT EXCEED 3 SERVINGS (15g) DAILY WITHOUT PROFESSIONAL ADVICE. Balance 100% Pure L-Glutamine contains only pharmaceutical grade L-Glutamine and has been extensively tested and packed under the strictest Quality Control procedures to provide the purest L-Glutamine available.